Arrival: Please plan for traffic delays and allow extra time for parking. Have your pre-purchased permit out before you reach the gate. Departure: We highly recommend that you DO NOT exit at 5 pm, as there will be very long wait times to exit the garage into surrounding rush-hour gridlock traffic. A parking selection is required to complete registration. 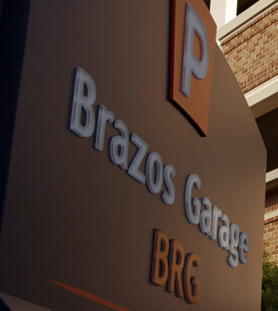 Brazos Garage has limited availability. Only those who pre-purchase parking are guaranteed a space and the lowest rate. When you purchase a permit, we strongly recommend you select "Create Account" during checkout. This will allow you flexibility to manage, change, or redownload your permit. If your plans change, YOU WILL HAVE THE ABILITY to alter the parking choices you make today. The permit you purchased online will be used to enter the garage. Have it out and ready to scan upon entry. While there will be staff directing traffic, patrons will need to scan their permit at the entry gate to get into the garage. For directions on how to scan your permit's QR code at the gate, see Orientation Garage Access. We will have staff directing traffic. Please follow their directions. They may ask you to enter at another gate, continue driving higher up the garage ramps, or to park in a particular space in order to facilitate traffic flow. Failure to follow their instructions may cause accidents and/or more congestion in the garage. Please expect normal Austin rush-hour delays, and heavy traffic and congestion around Brazos Garage. Plan accordingly. The permit you purchased online will be used to exit the garage. Have it out and ready to scan when exiting. While there will be staff directing traffic, patrons will need to scan their permit at the exit gate to get out of the garage. Please follow the directions of staff at the exit. They are there to ensure traffic flows out of the garage as quickly as surrounding city street traffic will allow. Failure to follow their instructions may cause accidents and/or more congestion in the garage. We highly recommend that you DO NOT exit at 5 pm as areas surrounding campus will be in typical rush-hour gridlock. Stay late for the BBQ or entertain yourself on campus until 6:30 pm or 7 pm. Traffic will be lighter, and your all-around experience will be more enjoyable.